You can visit your Local Pharmacy who can also offer advice and treatment if required, for a range of minor ailments. NHS 111 is the free number to call when you have an urgent healthcare need. It directs you to the right local service, first time. It is available across the whole of England making it easier for you to access urgent healthcare services when you need medical help fast. It is available 24 hours a day, 365 days are year. 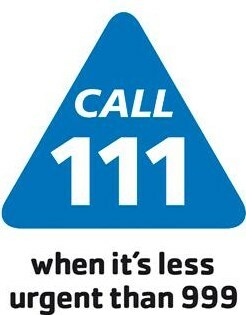 When you call 111 you will be assessed by fully trained advisers who are supported by experienced nurses and paramedics. They will ask you questions to assess your symptoms and give you the healthcare advice you need or direct you straightaway to the local service that can help you best. If the NHS 111 team think you need an ambulance, they will send one immediately. For more information on emergency and urgent care services visit NHS Choices.